The Takab area of northwest Iran is a large region of high mineral potential, but difficult access, for which an innovative exploration approach is required. Interpretation of aeromagnetic, Landsat TM, geological and mineral occurrence data are used to recognize the combination of mapped geological features, spectral characteristics, and magnetic signatures that could be associated with epithermal gold, arsenic, antimony, and base metal deposits in a 1,600 km2 area near Takab. 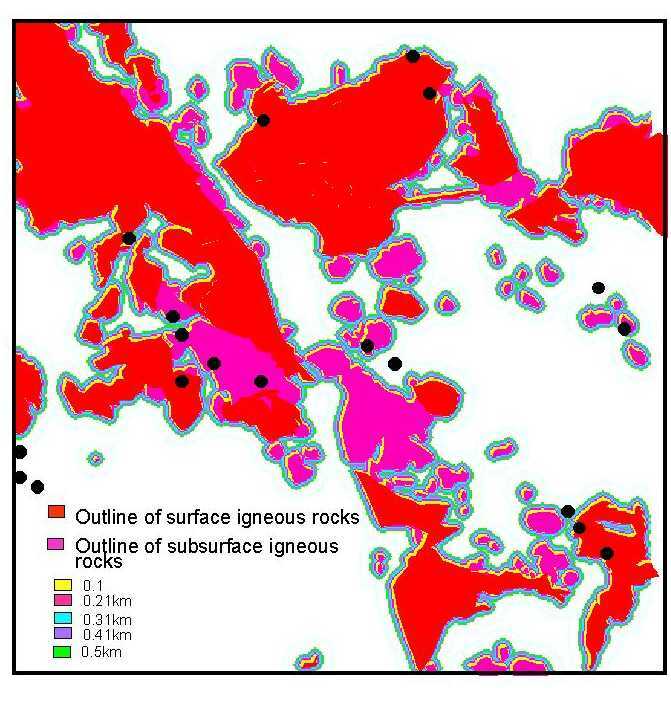 Geological data such as permeable reactive host rocks and surface igneous rocks and structures are integrated with interpretations of remotely-sensed data of hydrothermal alteration and subsurface igneous heat sources. 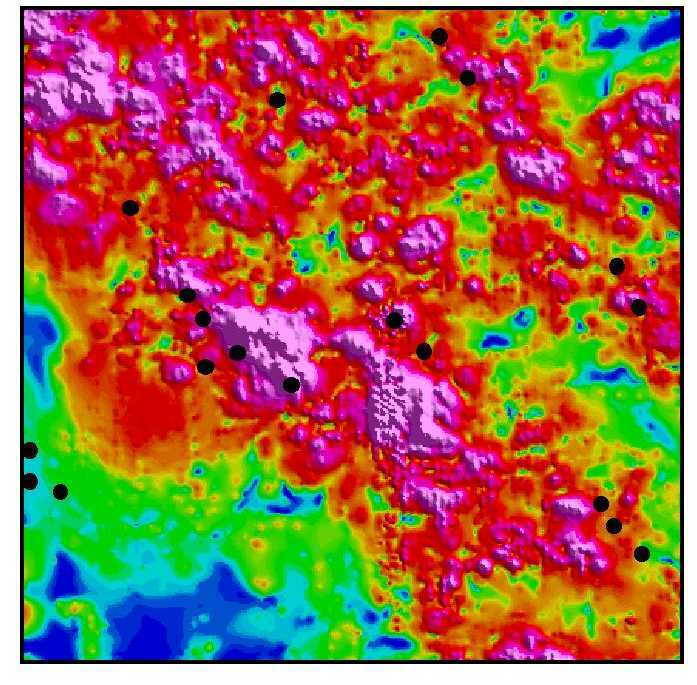 Four binary maps representing diagnostic deposit recognition criteria have been combined using a weights of evidence model, which uses the spatial distribution of 19 known mineral occurrences to calculate a final map of undiscovered gold and base metal potential in the Takab area. The Takab area, located in northwest Iran, is considered to be one of the most important gold mineralized zones in Iran. It includes an active arsenic mine (Zarshuran), two known gold deposits (Zarshuran and Aghdarreh), the largest lead-zinc mine of Iran (Anguran), another small-scale lead-zinc mine (Alamkandy), a large Cu mine (Baichebagh), and evidence of several ancient mining activities for gold, arsenic, antimony and base metals. The mineral occurrences of arsenic and antimony commonly contain considerable amounts of gold and silver, as do some of the base metals occurrences. In this paper we first review the geologic setting and mineralization of the Takab area and outline the recognition criteria for epithermal gold and base metal mineralizations. We then demonstrate the application of spectral and geophysical remote sensing tools for mapping hydrothermal alteration and igneous rocks and structures that could be spatially associated with the known mineral deposits. Based on weights of evidence analysis of geologic, spectral, and magnetic data representative of the deposit recognition criteria, a predictive geographic information system (GIS) model is constructed to locate areas of interest for further gold and base metal exploration. The Takab area (an area of 1,600 km2 to the north of the town of Takab) is mountainous and semi-arid; vegetation is scarce. It lies at the boundary of the Urumieh-Dokhtar Magmatic Assemblage (UDMA) and the Sanandag-Sirjan volcano-sedimentary Zone (SSZ), both of which extend more than 2,000 km in a NW-SE direction parallel to the Zagros thrust fault. Tertiary volcano-plutonic rocks of the UDMA cover around thirty percent of the area. Alavi (1993) has interpreted this boundary as the suture zone between the Afro-Arabian and the Iranian plates. It is characterized by a series of structural depressions, sheared and mylonitized rock sequences and high-angle and northeast-dipping shear planes. The Takab area has experienced repeated cycles of orogenic activity, including structural uplift, sedimentation, magmatism, and metamorphism (Alavi et al., 1982). The geological formations mostly comprise Precambrian metamorphics, Tertiary volcanics (with subordinate granitoids and sediments) and Quaternary sediments. The Tertiary volcanics are partially altered throughout the area. A major northwest-southeast trending fault puts the Precambrian metamorphics in juxtaposition with the Tertiary rocks in the middle of the area (Figure 1). In 1994 the Ministry of Mines and Metals of Iran published a complete report about the mineral deposits of the area. The known Au, As, Sb and base metal mineralizations in the Takab area are mainly epithermal in origin and are hosted by jasperoid, black shale, carbonates, and partially altered andesite. As for most of the known gold, As/Sb, Pb/Zn and Cu mineralizations in northwest, volcano-plutonic rocks of UDMA, are usually found a short distance from the known mineral deposits hosted by sedimentary rocks. Zarshuran, the largest gold deposit of the area, is a disseminated gold deposit hosted by Precambrian black shale and carbonates, which have been intruded by a weakly mineralized, highly altered, granitoid. This intrusion fractured the host formation and provided a favorable site for mineralizing hydrothermal solutions. Decalcification, sericitisation, and kaolinitization are the principal alterations at Zarshuran. The mineralization is mainly controlled by NE-SW and E-W trending, high-angle faults intersecting the south west limb of a NW-SE plunging anticline. Zarshuran, in many respects, is very similar to the Carlin type sediment hosted gold of the western United Sates (Asadi et al., 1999a). The gold mainly occurs as invisible gold associated with arsenian pyrite and sphalerite, visible gold is rare and occurs in orpiment and silica. (Asadi et al, 1999b). Compared to the Carlin-type deposits, the presence of higher tellurium concentration in the ore and close association with igneous rocks at Zarshuran, indicate a larger than typical magmatic component in the mineralizing hydrothermal solutions (Asadi and Hale, 1999). According to Middleton (1994), Agh-Darreh, the second biggest gold deposit in the Takab area, comprises two separate mineralized areas about 1.5 km apart, which occur in a domed, locally thickened Oligo-Miocene limestone, and are prominently marked by the occurrence of jasperoidal veins and lenses trending in a NE-SW and NNE-SSW direction. The mineralization is possibly epithermal in origin and is hosted by a limestone unit, in which the upper part of it is replaced by jasperoidal lenses. The intercalated tuffaceous volcanic lenses are present at the top of the limestone, and may relate to the volcanic rocks located 4-5 km to the NE (toward the Zarshuran). The richest mineralization occurs in the jasperoids and the ferruginous limestone located beneath the jasperoids. The exposure and drilling have shown widespread underlying iron and mangenese oxide rich horizons conformable with the limestone bedding. The jasperoid and the Fe/Mn oxide horizons are enriched to economic proportions in gold with accompanying arsenic, antimony, zinc, lead, silver, and barium. There also are a number of less significant As, Sb and Au prospects at the vicinity of Zarshuran and Agh-Darreh. Arsenic at Zarshuran is being worked on a small scale from a NE-SW trending silicified veins and lenses located in the Zarshuran Precambrian black shale unit. At Baldir-Ghanee, about 2 km northwest of Zarshuran, there are traces of antimony mineralization. The mineralization is recognized by massive silisification in the Oligo-Meocene limestone and shale, and is closely associated with Miocene volcanics. At Bighair-Bolaghi, located 1 km north of Baldir-Ghanee, there also are several indications of antimony mineralization in the carbonate rocks that are intruded by altered Oligo-Miocene andesite dykes (Karimi, 1993). There are several old workings for gold at Chaldaghi and Kalaki, a few km to the west of Zarshuran. In these two sites a number of small mineralized quartz veins occur at the top of Miocene volcanic sequences. Mohajer (1989) reported up to 5.4 ppm gold from a quartz vein at Kalaki. A small defunct antimony mine is located about 2 km to the north of Agh-Darreh. The stibnite mineralization at this mine is hosted by ferruginous carbonate, marl and black shale, and appears to be controlled by NE-SW trending faults. Highly altered granitoid rocks are widespread about 2 km to the north of the mineralization. Anguran Pb/Zn mine is the largest mine in the area. The ore body is hosted by fractured, Oligo-Miocene calcareous rocks, overlying Precambrian metamorphic and metavolcanic rocks. The dominant structure of the deposit is a ENE-SSW plunging anticline intersected by NW-SE and E-W trending faults controlling the mineralization. Ore minerals are mainly sphalerite and galena in the lower part of the ore body and smithsonite, hemimorphite, zincite, sericite and Fe oxides in the upper part. Oligo-Miocene andesitic rocks are located at the immediate vicinity of this deposit. There are further lead and zinc occurrences at Alamkandy and Arpachi. Mineralization at Alamkandy is hosted by ferroginous carbonates located at the contact of Precambrian metamorphic rocks. The mineralized rocks extend in a NW-SE direction. Vein type mineralization at Arpachi is hosted by Oligo-Miocene carbonates located at the close association with an altered Meocene andesite. The mineralization is controlled by NE-SW trending faults. Vein copper mineralization occur in fractured and faulted zones in altered Oligo-Miocene andesite at Baiche-Bagh. The main NNE-SSW structural trend controls the mineralization in this area. Silica, kaolinite, sericite and limonite are the main alteration minerals. The silicified veins, 0.5-1.5 m thick and up to 2 km long, commonly contain chalcopyrite, tetrahedrite, arsenopyrite, pyrite, sphalerite, galena, and bismotite. Bulk chemical analyses of a few samples indicated high Au and Ag concentration (Zanjani, 1945), and Bariand (1962) reported the presence of native gold associated with arsenopyrite. There are further copper occurrences, most of them old workings within the altered Oligo-Miocene andesite in the northwest of the Takab area. Mineralization in these occurrences is mainly controlled by E-W and NE-SW trending structures. Sediment-hosted epithermal mineralizations are an important type in the Takab area. The characteristics of Carlin-type gold deposits and other Au, As, Sb, and base metal deposits of the area mentioned above, are 1) host rock lithology, 2) associated igneous rocks, 3) hydrothermal alteration and 4) structures. High permeability and chemical reactivity provide favorable conditions for the precipitation of mineralizing hydrothermal solutions in the host formations of Carlin type gold deposits (Berger and Bagby, 1985). In the Takab area these conditions are provided in the Precambrian black shale and carbonates, and also in the fractured Oligo-Miocene calcareous shale, karsted limestone, ferruginous carbonate and marls, which host most of the known mineralization in the area. Nearly all of the Carlin-type gold deposits in Nevada, western United States, are spatially associated with intermediate to silicic igneous rocks that are either exposed or buried at depth (Bagby and Berger, 1985). There are partially altered andesites and highly altered granitoid rocks of Oligo-Miocene in the immediate vicinity of the Zarshuran gold deposit and also most of the other hydrothermal Au, As, Sb, and base metal mineralizations in the area. Asdai and Hale (1999a) attribute high amplitude aeromagnetic anomalies within the Takab area to high magnetic-susceptibility igneous rocks. The highest anomalies are located in the central part of the area and coincide with the location of the Zarshuran deposit and its surroundings. At a distance of 2-3 km from Zarshuran, these anomalies can be ascribed to widespread outcropping on Oligo-Miocene volcanics, some of which are mineralized. In the immediate vicinity of Zarshuran, the rocks seen at the outcrop are Precambrian and Oligo-Miocene sediments, and high amplitude analytical signal anomalies, suggesting the presence of igneous intrusive rocks beneath the Zarshuran deposit and other nearby As, Sb mineralizations. Oligo-Miocene volcanic rocks and granitoids appear to provide the main heat sources for the hydrothermal systems responsible for Au, As, Sb, and base metal mineralization, and also have been the main source of Au-bearing hydrothermal solutions (Asadi and Hale, 1999). Some igneous bodies of the area have been altered and mineralized indicating the hydrothermal systems post-dated associated magmatic events. The presence of hydrothermally altered zones is an important guide to epithermal deposits of the area. Two types of hydrothermal alteration argillic and Fe oxide, are associated with most of the known mineral deposits of the area (Asadi and Hale, 1999b), and provide equally important deposit recognition criteria. For example, the Zarshuran gold deposit is characterized by argillic hydrothermal alteration, while the Agh-Darreh gold deposit is characterized by iron oxide hydrothermal alteration. Structures, particularly at the structural intersections, are important for controlling magmatism, hydrothermal fluid flow, and mineral deposition in the Takab area. Most of the know mineral deposits of the area are located in a 500 m buffer zone from the NE-SW and E-W trending lineaments interpreted from Landsat TM data (Asadi et al., 1998). At the district and deposit scale the NE-SW, NW-SE and E-W trending faults and their intersections appear to control the mineralization in most of the known deposits of the area; for example, NE-SW trending faults are the most important controls on the development of mineralized jasperoids at Zarshuran and Agh-Darreh. A digital data base of mineral deposits on likely controls on mineralization in the Takab area was established. The data sets consisted of 1) exposed Oligo-Miocene igneous rocks digitized from the 100,000 scale geological map of the area; 2) lineaments digitized from the geological map and derived from the shaded relief total intensity magnetic field image; 3) buried igneous rocks interpreted from the analytical signal of total aeromagnetic data and 4) hydrothermal alteration zones interpreted from the selected Landsat TM bands and reduction to the pole of total aeromagnetic data. Most of the mineral deposits of the area were digitized from the mineral occurrence map of the Takab-Shahin-Dez quadrangle (1:250,000 scale) published by Ministry of Mines and Metals of Iran in 1994. Some of the small occurrences were digitized from 1:100, 000 scale geological map of the Takab area published by Geological Survey of Iran in 1998, and also from the district scale geological maps of Zarshuran and Agh-Darreh mining area. A database of 19 mineral occurrences was compiled from these maps. Bonham-Carter et al. (1989) and Bonham-Carter (1994) described the way in which the quantitative relationships between data sets representing the deposit recognition criteria and known mineral occurrences is analyzed using Bayesian weights of evidence probability analysis. A similar approach is applied here to the Takab area. A series of binary maps is created. The locations of known mineral occurrences are treated as points. 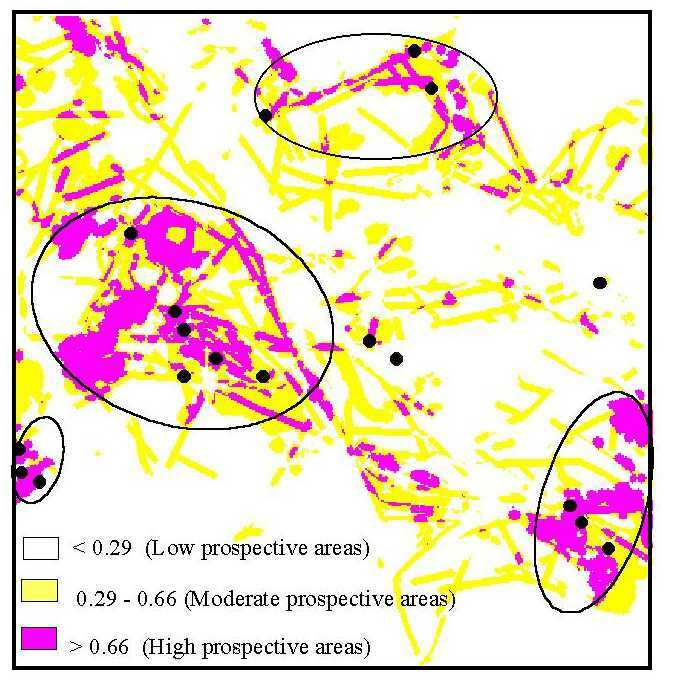 In the spatial data analysis, a pixel size of 100 m by 100 m (a nominal mineral occurrence area) is used to rasterize the input vector maps representing the deposit recognition criteria and mineral occurrence point map in order to ensure that only one point is present in any given pixel. The binary predictor maps are used as input maps and the end product is an output map showing the probability of occurrence and the associated uncertainty of the probability estimates. According to Bayes� rule, a binary hypothesis is tested when a certain domain (binary predictor pattern) is present (equation 1) or absent (equation 2). In the case of positive associations, more known mineral occurrences fall in the test domain (DP), than would be expected if the mineral occurrences and test domain are unrelated. Conversely, a negative association implies the occurrence of fewer known mineral deposits in the test domain than would be expected if the mineral occurrences and test domain are unrelated. These weights give unitless measures of spatial correlation between mineral occurrences and a geological feature representative of a deposit recognition criterion (i.e., test domain). The contrast, C = W+ � W-, combines these weights into an overall measure of association for a given test domain. For a positive spatial association, C is positive; C is negative in the case of negative correlation. In the case of a large area and a large number of mineral occurrences, for each test domain, the maximum contrast often gives the best measure of spatial correlation with the mineral occurrence points (Bonham-Carter, 1994; Turner, 1997). In the case of a small area and a small number of mineral occurrences, the uncertainty of the weights could be large and C can be meaningless and the Studentized value of C, calculated as the ratio of C to its standard deviation, C/s(C), serves as a test that the spatial correlation between the mineral occurrence points and a test domain is statistically significant (Bonham-Carter, 1994). The standard deviation of C is the square root of the sum of the variances of the weights. The Studentized value of C is used to define the optimum cutoff. There procedures are implemented in a GIS. Binary maps (test domains), representing the four deposit recognition criteria, are generated and for each map the weights are calculated (i.e., a value of W+ for presence and of W- for absence) at every location (pixel). Then the weighted binary maps are combined to create a final predictive map. Weights of evidence analysis is used to quantify the spatial correlations between the geological features, representative of deposit recognition criteria, and known mineral occurrences. Four maps representing favorable host lithology, igneous heat sources, hydrothermal alteration and structural features are created and used for weights of evidence analysis. Distance maps showing buffer zones at distances of 100 m to 500 m (in increments of 100 m) away from the outline of geological features are constructed, and weights of evidence (W+, W-), contrast C and Studentized values of C are calculated to select the optimum distances that have the best spatial correlation with the known mineral occurrences. The outcropping Oligo-Miocene volcano-plutonic rocks (i.e., andesites and granitoid intrusions) were selected as a polygon coverage from the 1:100,000 geological map of the area. The surface mapped igneous rocks constitutes 21.4 % of the study area. High resolution aeromagnetic data of the Takab area have been used to re-map the main geological units and infer the subsurface geology. These data were retrieved from nine analogue total magnetic intensity contour maps (1:50,000) produced as part of an aeromagnetic survey of the Takab-Shahin-Dez Quadrangle in 1978. The flight lines were oriented north-south with a spacing of 500 m and a nominal terrain clearance of 120 m.
Analytical signal analysis of the total magnetic intensity is used to identify anomalously high magnetic fields associated with high magnetic susceptibility igneous rocks, both outcropping and at depth (Paterson and Reeves 1985). Figure 3 is the shaded relief colour analytical signal of total magnetic intensity map of the Zarshuran area in which anomalously high amplitude analytical signal anomalies appear as purple shades. Within the Zarshuran area, high amplitude analytical signal anomalies are likely to be caused by the high magnetic susceptibility of igneous rocks. The highest anomalies are located in the central part of the area and coincide with the location of the Zarshuran deposit and its surroundings. At a distance of 2-3 km from Zarshuran, these anomalies can be ascribed to widespread outcropping Tertiary volcanics. The analytical signal analysis of aeromagnetic data was used to map high magnetic-susceptibility igneous rocks at depth. 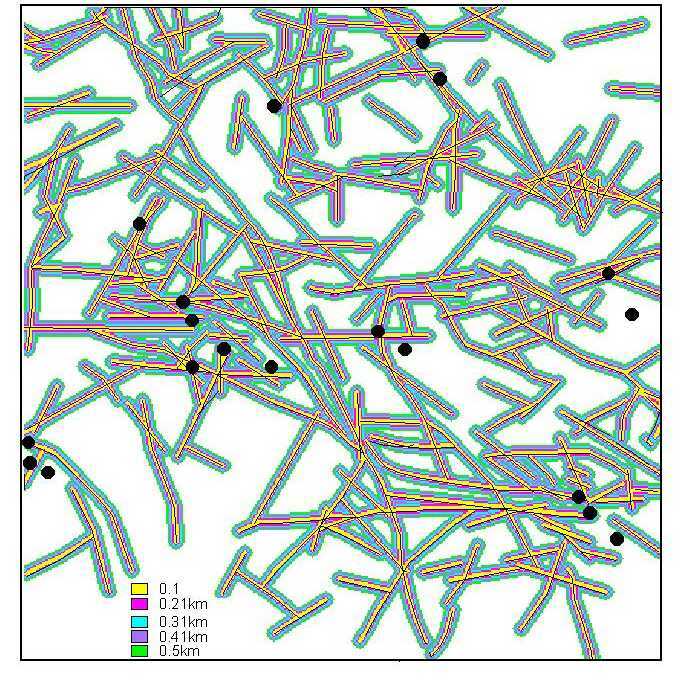 Most of the interpreted igneous rocks from the analytical signal image consist of high confidence subsurface extensions of exposed Tertiary andesites (Fig. 4). The Tertiary andesites are partially mineralized and spatially associated with most of the known mineral deposits in the area. The selected subsurface igneous rocks represent 6.8 % of the study area. 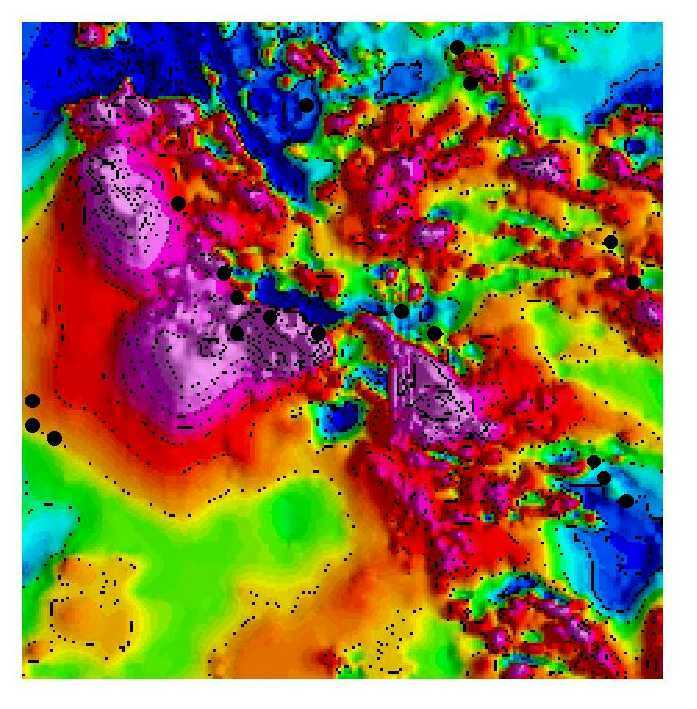 The surface mapped Tertiary igneous rocks and the interpreted high magnetic-susceptability igneous rocks beneath the sediments are combined in a binary raster map to represent the heat sources driving the migration of mineralizing hydrothermal solutions in the area. The resulting heat source domain map was buffered at distances of 100 m to 2,500 m, and weights of evidence, contrast C and Studentized value of C were calculated (Table 2). The optimum buffer, yielding the maximum Studentized value of C, was defined at 200 m. The resulting buffered igneous heat source domain constitutes 31.49 % of the area, and 13 out of 19 occurrences are present in this domain (Figure 4). Asadi and Hale (1999a) applied a principal components (PC) transformation to the selected reflective Landsat-TM bands of the Takab area and mapped iron oxides and hydroxyl-bearing minerals, some of which are hydrothermal alterations associated with the known epithermal mineralizations in the area. Ground truthing and spatial analysis indicated that most of the mapped hydroxyl zones are spatially associated with the igneous heat sources and controlled by linear structures of the area. They are mainly argillic hydrothermal alteration, which characterizes many of the known mineral deposits. Some of the mapped iron oxide zones are located in the southern part of the area, where there is no evidence of volcanic activity to form hydrothermal alteration. These iron oxides in the south, associated with the Miocene Upper Red sandstone formations, are attributed to surface weathering. In addition, reduction to the pole of the total magnetic intensity data is also used by the authors (1999a) to map iron oxide hydrothermal alteration zones associated with epithermal mineralization of the area. They argued that zones of weak magnetic responses highlighted by reduction to the pole image likely arise from the demagnetization of magnetite when it is in contact with hydrothermal fluids, yielding epigenetic hematite and limonite. In order to have high confidence that iron oxides in the weights of evidence analysis resulted from hydrothermal alteration, the iron oxides mapped by selected PC techniques and those mapped by reduction to the pole technique are crossed, and the overlapping zones extracted for the weights of evidence analysis. 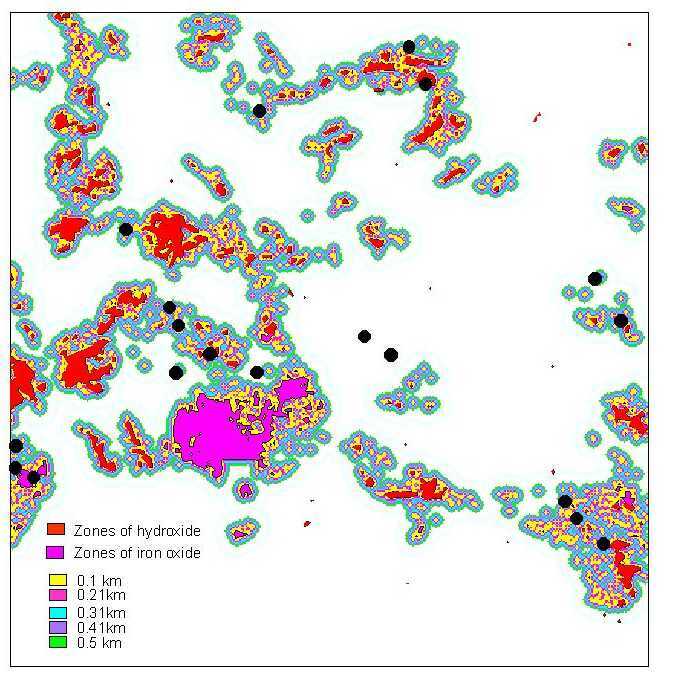 Argillic hydrothermal alteration and iron oxide hydrothermal alteration are combined into a new map used as the third binary predictor input map for weights of evidence analysis. The resulting hydrothermal alteration domain map was buffered at distances of 100 m to 500 m, crossed with the raster mineral occurrence map and weights of evidence, contrast C and Studentized values of C were calculated (Table 3). The optimum buffer, that yielding the maximum Studentized value of C, was defined at 300 m. The resulting buffered hydrothermal alteration domain covers 20.56 % of the study area, and 12 out of 19 occurrences present in this domain (Fig. 5). The weights of evidence analysis reveals a strong correlation between the hydrothermal alteration and mineral occurrences (Table 3). Faults trending NE-SW, E-W and NW-SE, which have spatial association with known mineralization in the area, were digitized from the 1:100,000 geologic map of the area. In addition, shaded relief total magnetic intensity data of the area was used to map those structures (i.e., surface and subsurface faults) that were not recorded on the geological map. Successful representation of lineament features in shaded relief depends on the choice of illumination azimuth (preferably perpendicular to the linear features), illumination angle above the horizon and the exaggeration of vertical scale. For the Takab area, two different illumination angles were chosen to map the structures trending in different directions. A shaded relief map of total magnetic intensity with artificial illumination of azimuth of 45 degree, an inclination of 45 degree and a scale factor of 0.35, highlights the major structural features, oriented in a NW-SE direction, which is parallel to the Zagros thrust. A map with azimuth 315 degree, inclination 45 degree and scale factor 0.35 shows lineaments perpendicular to the major structures (Figure 6). Many of the known mineral deposits of the area lie on or close to these lineaments. The predictive exploration model was generated by summing the weights of evidence of four binary maps representing the epithermal gold and base metal recognition criteria in the Takab area (Table 5). The various overlap combinations of the binary maps resulted in the highest cumulative weights in the area where all of the recognition criteria exist. The lowest weights are located in the areas with a scarcity of favorable conditions. The predictive weights range from a maximum of 4.10 to a minimum of �3.06, providing a relative measure for prioritizing areas of exploration potential. This model assumes conditional independence of the input recognition criteria binary maps (Bonham-Carter, 1994). Based on the coincidence of the ranked criteria, the resulting predictive map was classified into three categories: low, moderate, and high (Figure 8). The threshold between low and moderate prospectivity zones is set by W+1 + W+2 � W-1 + W-2, where the subscripts refer to the domains with the two lowest positive weights, thus +0.78 + 1.05 + (0.77) + (0.75) = + 0.31. The threshold between moderate and high prospectivity zone set by the corresponding calculation based on the domains with the three lowest weights, and is thus + 0.66. The final predictive GIS model (Fig. 8) places 16 of 19 (84 %) of the mineral deposits of the Takab area (including all the major Au deposits and base metal mines) in the high prospectivity zone (8.5% of the total area). The model identifies four important mining districts, namely Zarshuran in the central part, Agh-Darreh in the southwest, Anguran in the southeast, and Biche-Bagh in the northeast. In addition, the model highlights some unrecognized favorable areas that require follow up investigations. These favorable areas are located in the northwest, in the central-south between the Zarshuran and Anguran mining districts, and some small areas in the western part of the study area. Alavi, M., 1993. Tectonics of the Zagros Orogenic Belt of Iran: New Data and Interpretations. Tectonophysics, 229: pp. 211-238. Alavi, M., J. Hajian, M. Amidi and H. Bolourchi, 1982. Geology of Takab-Shahin-Dez Quadrangle. The Ministry of Mines and Metals of Iran, Tehran, p. 100. Asadi, H.H., J.J.M. Carranza and M. Hale, 1998. GIS and Remote Sensing for Epithermal Gold Exploration in the Northwest Iran. International Conference on GIS for Earth Science Applications, Ljublijana, Slovenia, 17-22 May 1998, pp. 57-73. Asadi, H.H., J.H.L. Voncken, M. Hale and R.A. Kuhnel, 1999a. 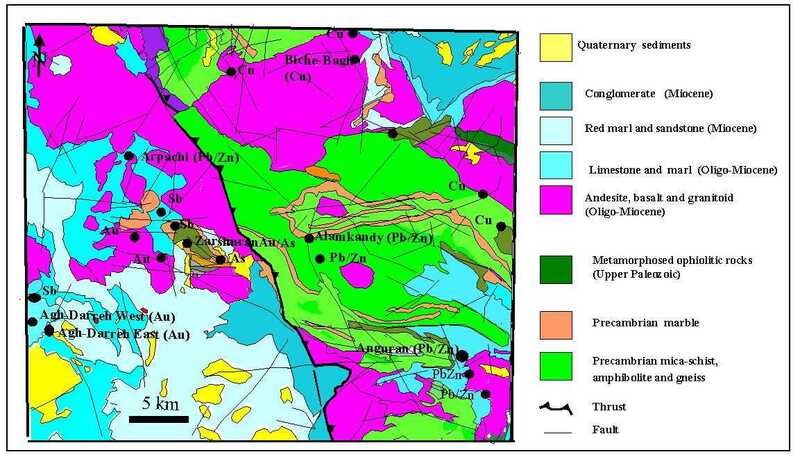 Petrography and mineralogy of the Zarshuran gold deposit and their implications for ore genesis. Mineralogy and Petrology [in press]. Asadi, H.H., J.H.L. Voncken and M. Hale, 1999b. Invisible gold at Zarshuran, Iran. Economic Geology [in press]. Asadi, H.H. and M. Hale, 1999a. Integrated analysis of aeromagnetic, Landsat TM and mineral occurrence data for epithermal gold exploration in northwest Iran. Thirteenth International Conference on Applied Geologic Remote Sensing, Vancouver, British Columbia, Canada, 1-3 March, p. 8. Asadi, H.H. and M. Hale, 1999b. Magmatic contribution to the Carlin-type gold deposit at Zarshuran, Iran. Joint SGA-IAGOD International Meeting, Imperial College, London, August 1999, p. 4. Bariand, P., 1962. Contribution a� la mineralogie de l� Iran, Ph.D thesis, Univ. Paris, Faculte des Sciences. Berger, B.R. and W.C. Bagby, 1985. Geologic characteristic of sediment-hosted, disseminated precious metal deposits in the western United States. In: Berger, B. R. and Bethke P. M. Geology and geochemistry of epithermal system. Society of economic geology, Reviews in Economic geology, 2: pp. 169-202. Bonham-Carter, G.F., 1994. 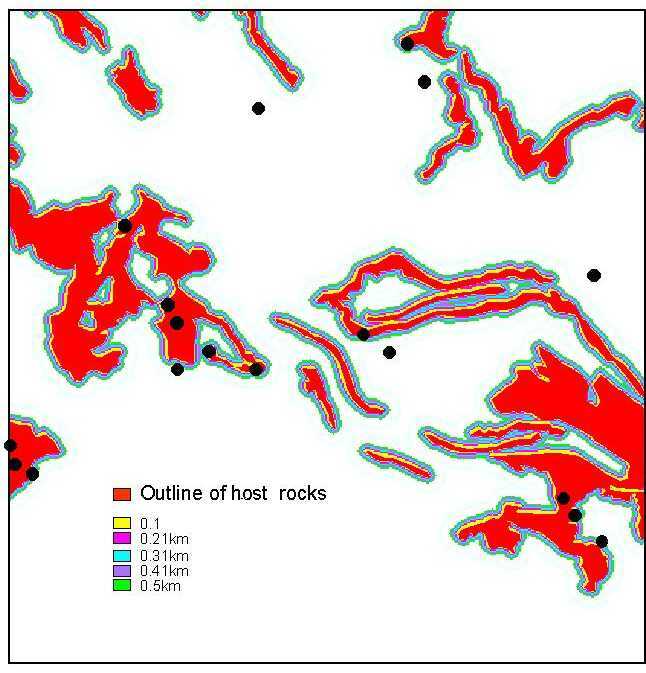 Geographic Information Systems for Geoscientists, Modelling with GIS. Pergamon, Ontario, p. 398. Bonham-Carter, G.F., F.P. Agterberg and D.F. Wright, 1998. Integration of Geological datasets for gold exploration in Nova Scatia. Photogrammetric Engineering and Remote Sensing, 54: pp. 1,585-1,592. Karimi, M., 1992. Geology, petrography and mineralogical studies of Zarshuran gold deposit. Kansaran Engineering Company, Tehran [in Persian]. Middleton, T.W., 1994. Exploration at Agh-Darreh, West Azarbaijan province of Iran. Open file report, Persian Resource Company, Perth, Australia. Mohajer, G.H., H. Parsaie, N. Fallah and F. Ma'dani, 1989. Mercury exploration in the Saein Dez- Takab. Ministry of Mines and Metals of Iran, Tehran [in Persian]. Paterson, N.R. and C.V. Reeves, 1985. Applications of Gravity and Magnetic Surveys: The State-of-the-Art in 1985. Geophysics, 50: pp. 2,558-2,594. Turner, D.D., 1997. Predictive GIS model for sediment-hosted gold deposits, north-central Nevada, U.S. Proceedings of Exploration 97: Fourth decennial international conference on mineral exploration, pp. 115-126. Zanjani, A., 1945. Biche-Bagh copper mine. Open file report, Ministry of Mines and Metals of Iran, Tehran, p. 15.